Discussion in 'What's left to Talk About?' started by artandsoul, Feb 7, 2019. BatUtilityBelt, toomanycats and Gergo like this. BatUtilityBelt and Mossman like this. Is that a lefty ? tlarson58 and artandsoul like this. I remember when I first saw that thing. I didn't know whether to feel embarrassed for Gibson, because they were obviously bankrupt of ideas, or to feel insulted because they think we'll buy any stupid, lazy, ugly guitar if it says 'Gibson' on the headstock. I hate this with every atom of my being. DonM, tlarson58, Mossman and 2 others like this. 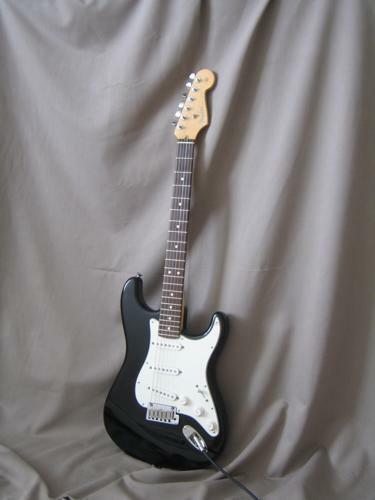 I could go the rest of my life without seeing another black strat shaped guitar with a white PG. manco53, Jaymo, Bubba Zanetti and 7 others like this. The Tele Flying V, or "Flycaster" as it has been called, is pretty friggin' stupid. manco53, Bubba Zanetti, DonM and 3 others like this. Jaymo, Mossman, toomanycats and 1 other person like this. Bubba Zanetti and Mossman like this. I would extend that to include any solid-colored guitar with a white pickguard. That always looks cheap to me. Ugh... I've never seen that one. I like the regular Flying V shape with Tele accoutrements better. No accounting for taste. Of course, Scott's tastes are so much more refined than the rest of us common rabble. We couldn't possibly appreciate its finer design points, I guess. Of course we can't appreciate the finer points of anything Scott may have. According to him, we are all "dumb motherfuckers" anyways. fullonshred and Mossman like this. manco53, LongBlackTie, BatUtilityBelt and 7 others like this. andrewsrea, fullonshred, Mossman and 1 other person like this. Mossman and rmfroyd like this. I'm worried that scientists will mess with DNA and come up with a human equivalent to this. BatUtilityBelt, andrewsrea, nomadh and 1 other person like this. On a similar note, but just way more... uh... wrong. manco53, Jaymo, BatUtilityBelt and 3 others like this.